Note: I will assume that Inman is making a point about Christianity above other religions unless otherwise noted. 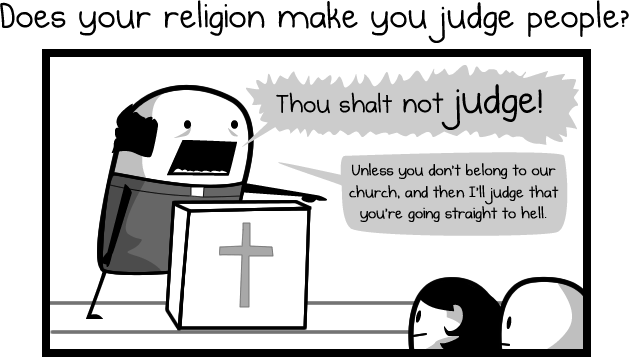 This is an often cited argument, that religion tells its adherents not to judge, but they end up judging others anyway. Now, in the one sense, this is a valid point. Hypocrisy is something to be despised. I for one abhor it and have taken the line in front of a congregation from the pulpit. Of course we are told not to judge, for who among us is any purer in virtue than any other? If someone is taking the line that “I am better than you, so you are below me,” and they claim to be following Christ, they are clearly not. I can see, though, how someone outside the church would view it: as the entirety of the church coming down on them. However, one must understand that Christianity at least is not a religion for the saved, it is for the unsavedâ€“for sinners. 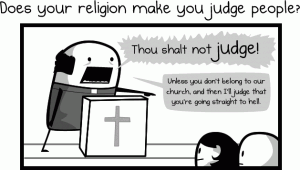 So of course adherents of the religion will end up judging others, because they are sinners and screw up. That doesn’t mean we should vilify the religion for the conduct of those in need of rebuke. On the other hand, there are circumstances when we must judge. If we do not call out one another (within the church), how will we know when we have fallen? How will we learn from out mistakes? And if we truly believe that others’ actions may cause them to go to hell, why should we not try to aid them? I’m not advocating zealous proselytizing here. Don’t think I would expect a Christian to tell anyone they are going to hell (how would they know anyway? ), but I would expect that, through the way they live their lives and interact with others, they might seek to bring others into the fold. Oh, the old “you persecuted Galileo” argument. I’m not going to go into a lot of detail here, but this is bunk. We should all know by now that Copernicus discovered a lot of the things GalileoÂ later rediscovered and published in a book (albeit with a little note saying it was theoretical only). The church then didn’t really care. The problem with GalileoÂ was he was kind of a jerk about it and tried to subvert and annoy the church any chance he got. 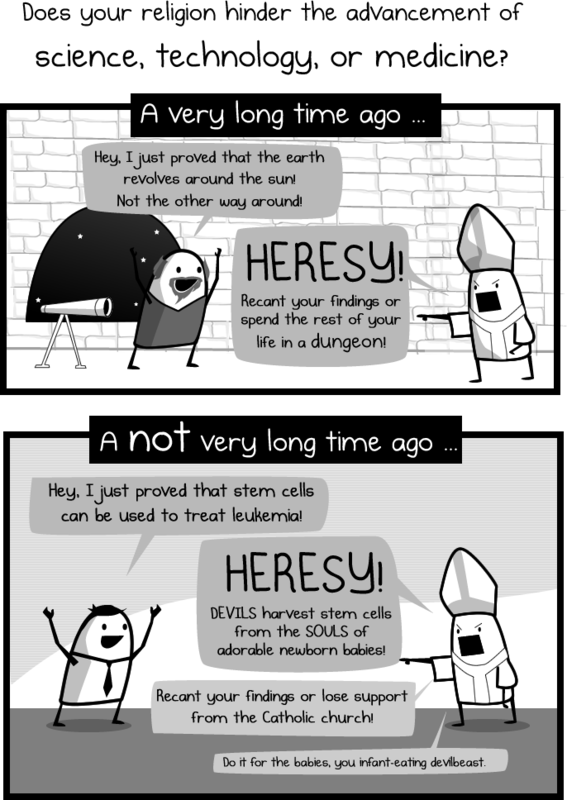 At any rate, the idea that the church hates science is ridiculous. Aside from some nutty protestant groups, no serious religious person would think that modern science as a whole is evil. Even more silly is the specific calling out of the Catholic church here, the same organization which donates heavily to the science and to CERN. The issue here Inman seems to take issue with is that religion has a sense of moral duty when it comes to science. We ask not only “can we?” but “ought we?” and these are monumentally different questions. To take the argument here about stem cells, the question becomes “are we assuming these stem cells to be from aborted babies?” If so, weÂ haveÂ to ask, “Is this right?” Is it morally right to sacrifice an unborn child so that someone else may live? That doesn’t have a clear-cut answer because there are so many factors. But those in the church who have thought about these things long and hard have a final answer after much deliberation and reasoning: “No, it isn’t.” Often, I find, atheists react only with this last portion of the reasoning chain, not bothering to ask why, and assume that the church has come to some knee-jerk reaction based on some baseless belief system. If they stopped to think about it, they might discover underlying arguments about what is life, how much is one person’s life more valuable than another’s, what if we were wrong about the unborn, etc. These two go together. There has been some considerable noise, especially from Europe, that teaching religion to one’s children is tantamount to child abuse. Without assessing that fact, or in this case, assuming the religion is without merit because it was passed down through time. Even taking the simple approach of saying that religion is simply a moral system, one can easily see why this is silly on its face. First, by accepting this argument you have to start asking “Well, what is permissible to teach your own children?” You can get by easy by saying “Well, education and stuff” which is correct. But parents are responsible not just for what their children know, but how they behave. How does one know how to behave? Through a system of morals. How does one learn morals? Through religion or ethics, and ethics, if we are honest, is a subset of religion. One would have to start saying that any moral system is not valid to teach their child because it might align with a religion. This is because, as a subset, ethics can only go so far in explaining why one must act in a certain way. At some point, we have to say something arbitrarily if we are to avoid using religion. And this doesn’t mean the arbitrary reasons are bad or not well thought out; most are and have books on the subject, but they are still arbitrary at their base. Second, why is religion the only thing that is apparently bad to teach your kids? What about other non-verifiable subjects: economics, political theory, poetry, etc? These are not definitively quantifiable subjects yet they are valuable to children just as adults. Are they only to learn such things when they are older? As a corollary, I must say that Inman is partly right. There is something sad about someone who is brought up in the church on authority alone. If a child is not taught how to reason through the teachings of his faith on his own, what good is thatÂ faith? Does he truly understand, or is he now parroting an ideology? This is actually a valid argument, but misses the point. No one, religious or otherwise, should try to validate their beliefs by simply converting others to their own mode of thinking. Doing this for the sake of validation is no better than trying to validate your having stolen someone’s cake by trying to convince your friends you were oh so hungry and shouldn’t you have been able to have that piece in the fridge. The argument misses the point in assuming that is what proselytizing is all about. It fails to take into consideration that those who are coming to your home might have a genuine interest in your well-being. They might not have the best tact in the world, but they do care about you. Again though, I have to say that I’d rather convert by deed than by Bible thumping. It would be easy here to say that Inman is saying that all religion is insane and he is a bad man for saying so, but I have to side with him a bit. From the outside, all regions seem a bit silly. Only with a willingness to understand do we discover that they are not all silly. Some, of course, might be deeply flawed from our perspective, but we cannot go around saying that they are insane when from their perspective we are equally nuts. We all have to understand that we are all seeking after the same thing and that some have been misled by some wrong ideas. This applies to all philosophies. This is not to say that all religions lead to truth, but it does mean that all religions have some truth in them or they would not be believable to any sensible man. Again, I have to side with Inman on this one. No one should vote their religion solely on talking points, but we do have to make a distinction. If we are saying, “Don’t just vote this way because others in your religion voted the same away,” then yes, that’s true. We must all evaluate issues based on the facts on hand and on how our morals tell us we ought to react to those facts in order to bring about the best outcome. The issue here is that often I hear that religious people should stay out of politics altogether, which is nonsense. Â Saying a group cannot be part of a political dialogue because of his beliefs is to ban all political dialogue. All people in a free society have a vision that they would like to see come to pass for their country or the world. and they have different paths they would like to get there. Conservatives and liberals, for instance, both, I sincerely believe, have everyone’s best interest at heart, but they have entirely different and contrasting views about how to bring about those goals. Similarly, those in religion have goals and interests. You might say, “but I don’t want them forcing their religion down my throat,” or more succinctly, “I don’t want to live according to their rules.” However, every group wants to exert its will over others to bring about their vision of society. Just as you don’t agree with their views, they don’t agree with yours, but we have to have a dialogue and work something out when we all live in a free society. Saying they aren’t allowed to the table because they hold certain views is the opposite of what I think Inman wants. 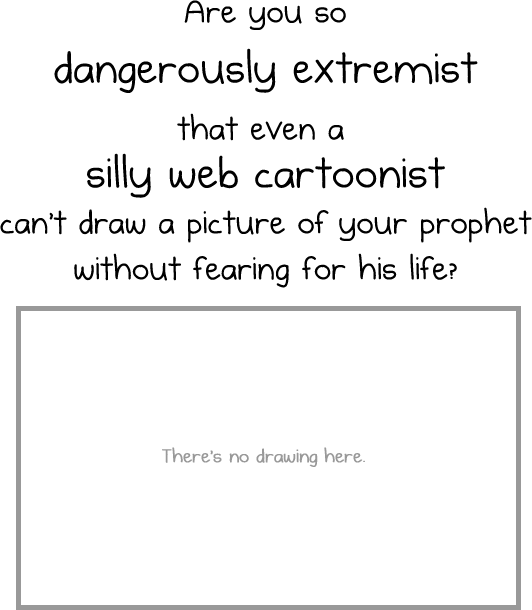 No one likes extremists and no one should have to face violence for their honest views. I can hear some people decrying the Inquisition and crusades, but while I’m not going there in-depth, I will say that those were different times with bad men at the heads of good organizations using good-minded men to do their misdeeds for them. Inman says this like it is a bad thing. I get that he is saying that some people are nuts and believe demons are out to get them, but the subtler message here is that no one should be willing to die for their religion, or by extension, their beliefs. This has no clear-cut answer, but I have to ask, is anything worth dying for? Are there principles that are worthy of giving one’s life for? Would you die for love? or honor? or your country? What separates these from one another? You can easily say that you should die for your country to preserve our way of life, but then why should we die when we could just take on another way of life instead (by force)? You might equally say, nothing is worth dying for, but I’d then have to ask, then what is worth living for if you could not give yourself wholly to it? Here Inman concludes with two views. The first is that no one should kill for their religion. It would be easy to condemn Muslim extremists and excuse some who kill in the name of the Christian god, but really, neither is right. Should one kill toÂ protectÂ their religion? I’d have to refer to the last paragraph. Should someone kill others because they are not of the same religion? Of course not. There are, of course, those who use religion to get what they want, and wars and terrible acts have been carried out in their religion’s name. That doesn’t make them excusable. At the same time, we can’t say that religion is bad because of it. We in America like republicanism and Â have in the past tried to convert other countries to it by force, sometimes disastrously. Does this mean that republics are bad? Of course not. 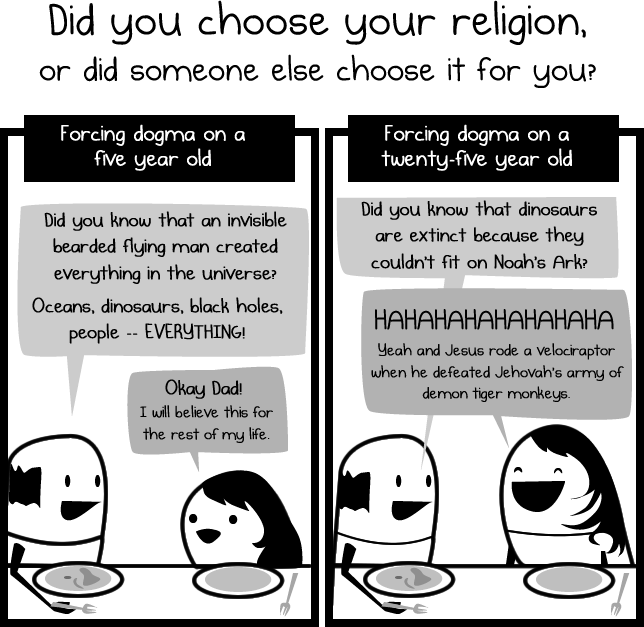 We cannot use such an argument against religion carte blanche. Inman’s second closing point is that of the soft atheist: If it makes you feel good about death, fine, but don’t discuss it in the public forum. This masks the underling nihilism of the atheistic view-point. Usually though, as here, while discussed in an offhanded way, the logical conclusion of no religion being true is that all ends in nothingness and without value. It is easy in the face of that to dismiss religion as a numbing agent for that realization. It is also easy to say that because of that nothingness, all things are permissible such that I should have the maximum amount to pleasure before I am snuffed out of existence. This leads of course to, why bother? But that is almost never addressed. The plea is to simply leave hedonism in the face of nihilism to its own devices and jettison any view of our bettering the world to the four winds. Then again, it might be worth using this argument against Inman saying that “If it all leads to nothing, my annoying you with Bible verses will have the same result in the end as though I left you alone.” One could of course carry it further and justify just about anything in this view, but I doubt Inman would have though of such an outcome as conscionable. In the end, I am underwhelmed by Inman’s post, though I know a lot of people online are thrilled. To me, it seems more a rant against ideology than against religion per se. If you replaced the word “religion” with “ideology” throughout the comic, I would be in 100% agreement with all of Inman’s arguments. 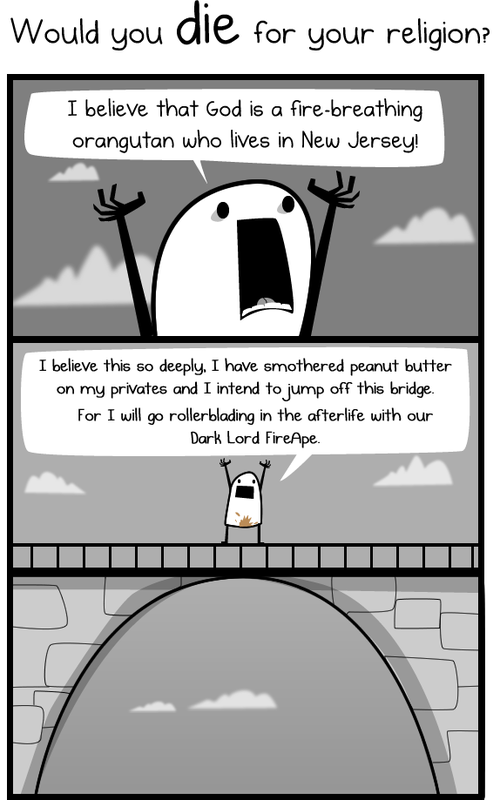 And truth be told, I think that is really what has turned him off of religion. Religion and politics are breeding grounds for ideologues who care only for their viewpoint as the thing of value itself. Religion, at least Christianity, is a method of guidelines that are divinely inspired which lead to our becoming more than simply weak and selfish humans. Ideology is the idea that it’s the method that is everything, the goal be damned, and by any means we must spread it. We are all guilty of it in some way. Any time we want to simply crush someone else for not holding the same view as us instead of seeing them as another human being with their own hopes, rationality, and aspirations, we fall prey to the pride of ideology. If this is Inman’s beast he wishes to slay, then I say carry on. This entry was posted on July 25, 2012, 7:46 am and is filed under Christians, Misc., Religion. You can follow any responses to this entry through RSS 2.0. You can leave a response, or trackback from your own site.